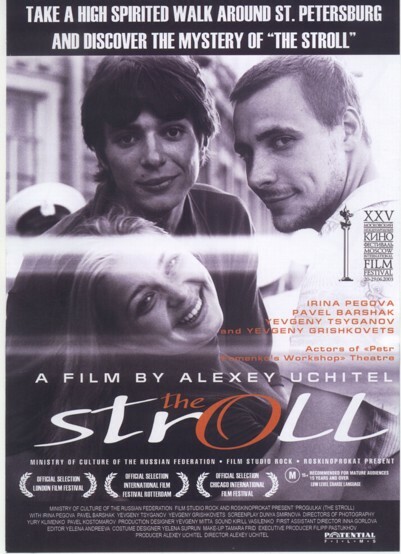 Story: Progulka (The Stroll) shows a concrete romance almost in real time, including courtship, jealousy and a duel between rivals. The location and time is a long walk through St. Petersburg. It is a film about the first generation of Russians who have grown up without Communism: energetic, high-spirited and rash. The love story is reminiscent of the classic Jules et Jim, but then with a different ending. The handheld camera floats and turns with virtuosity around three twentysomethings. The editing, at a high tempo yet fluent, provides spectators with the feeling they are watching a film made in one take. The stroll through the city leads through heavy traffic, past a building site and a football riot, between tourists up onto the cathedral and across the river. Almost immediately after Olya steps out of a limousine to start on her daily stroll, she is approached by Alyosha. He takes a fancy to the blonde, well endowed young woman with the tight jumper. Olya does not reject him out of hand, she even seems to appreciate his attention. When Alyosha decides to involve his best friend Petya as match-maker, the girl however turns out to be equally interested in both boys. Petya is also taken by Olya. As they stroll, a fierce battle unfolds between the two friends.